Setting up a VPN on an iPhone is not a difficult task. However, depending on which VPN you decide on, there a few different ways. The best VPNs for iPhone have custom apps that can be downloaded either from the iTunes store or the VPN’s website. Downloading and installing these VPNs is the same as installing any other app. However, to walk you through the process we have written this guide. Some VPNs do not have custom VPN software (known as a VPN client) for iOS devices. However, the vast majority of VPNs do provide subscribers with access to the OpenVPN configuration files (.ovpn files). These files can be used with the superb third party OpenVPN Connect software. Choose a VPN from the best iOS VPN services list. 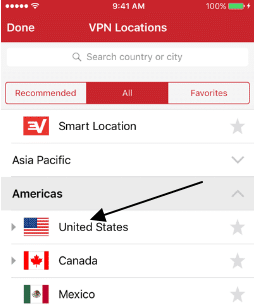 Navigate to the VPN’s website by clicking on the link and subscribe to your favorite iOS VPN. 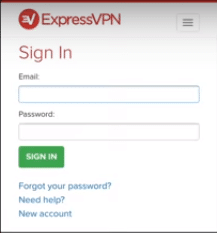 In this example, we used ExpressVPN. Remember, a yearly subscription will save you a lot of money. After subscribing, Log in using the credentials and password you entered when you subscribed. Tap on My Account or Downloads depending on the VPN. Alternatively, you may get the option to click “Set up ExpressVPN” (or whichever VPN you have subscribed to). You will now be redirected to the iOS set up page. Select “Download from the app store”. You will now be redirected to the VPN software. Installation is easy, so follow the on-screen instructions. During setup, your iOS device may ask you for your device passcode, enter it or use touch ID and click allow. Once you’ve installed the iOS VPN app, run the software. You will need to re-enter your credentials. In your VPN’s menu, select Settings (usually in a hamburger or cog menu). Select your preferred VPN protocol. We recommend that you use Open VPN encryption TCP or UDP. UDP is best for streaming. If this is not available please select Layer 2 Tunneling Protocol (L2TP)/Internet Protocol Security (IPSec) or IKEv2. Both those protocols are strong. Please do not use Point-to-Point Tunneling Protocol (PPTP), because PPTP is insecure. Finally, choose a VPN server from the list of server locations and click Connect. 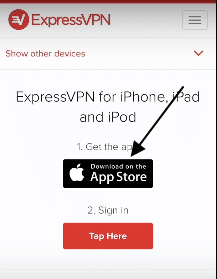 Once the VPN connection has been established, your iPhone/iPad VPN will show you the connection is enabled on the screen. Your IP address is now that of the VPN and your data is secure, so you can access any website you want. Some VPNs have an auto-start feature and auto connect feature. If you want to keep your VPN active every time you use the internet, select these options in the VPN settings. Alternatively, just start up the app manually each time you want to use it, select a server, and click Connect. PPTP – provides less security and privacy but is fast. 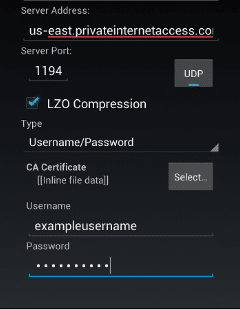 L2TP/IPSec – stronger security than PPTP but still not perfect. 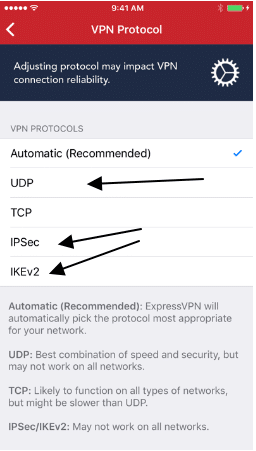 Internet Key Exchange version 2 (IKEv2) – the most widely used protocol for iOS VPN clients. It’s secure, but not as strong as Open VPN. OpenVPN – an open source and highly secure protocol. This protocol provides military-grade encryption if implemented correctly. All of the VPNs for iOS in this article provide it implemented securely. It’s sometimes necessary to download the third party Connect software. 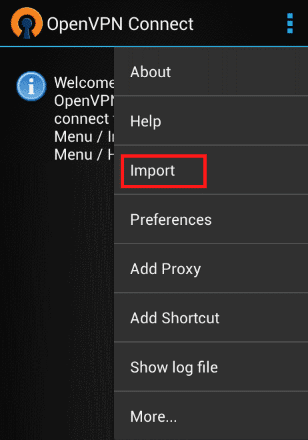 This is very easy and will allow you to use OpenVPN if you want to. For instructions on how to set up your VPN manually, see my guide below. Not sure what encryption to use? Check out our Ultimate Encryption Guide for more information. 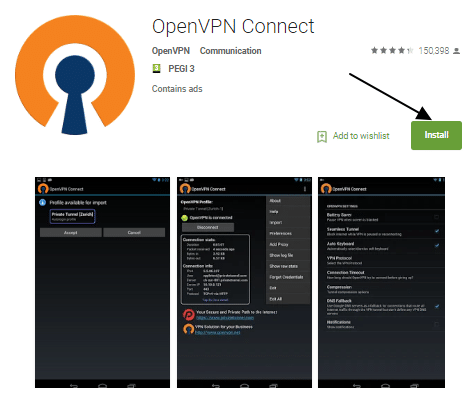 Download the OpenVPN Connect app. Navigate to your VPN’s website and download the OpenVPN config files (.OVPN files). You will usually need to do this on a PC because they are zipped up. These files will be in the download area where you got the VPN software. If you have any trouble at all finding these files on your VPN's website simply ask their support team. Download the config files for the servers you want to use. Unzip the files and email them to yourself (so that you can open them on your iPhone). Open the email on your iPhone and download the files onto your device to use them in the app. Open the Connect app and click on Import. Select the files that you saved on your device in step four. Once the files have imported, click on the server you want to connect to and type in your username and password. When the app connects, your device is secured with encryption and your IP address is that of the remote server. Now all you need to do is start up the Connect app and connect to a server whenever you want to use your VPN. The password should be automatically saved in the connect app so that you don’t need to re-enter it each time. Remember: your VPN will have its own guide for this. If you want o use it, ask their customer support to link you to that guide or look in the website's FAQ section. That guide will be specific to the VPN you subscribed to. However, it will have the same steps that have been listed here. Here at BestVPN.com, we regularly test VPNs to check their performance. That means you can read about their speed and overall performance on their individual reviews. However, we completely understand if you want to check your VPN client’s performance yourself. To do so, simply head over to this website to test your internet speeds with and without a VPN. The best thing to do is to select a test server near to you. Then click ‘combined test.’ This will test your upload and download speeds. Remember to check your speeds with and without a VPN to compare performance levels. Click on General, then scroll down and choose Profile. Once your VPN configuration profile is open, click Delete Profile. A pop up prompt will ask you for confirmation.Click Delete. The profile file will now also be removed from your iOS device.